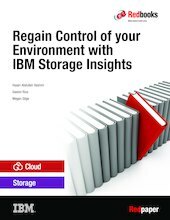 This IBM® Redpaper™ publication introduces you to the new, cloud-based IBM Spectrum Control™ Storage Insights (IBM Storage Insights, for short) offering, which is designed for small and medium businesses and organizations who need to quickly understand what is happening in their storage environment without implementing complex tools. IBM Storage Insights can be set up in less than 5 minutes and provides actionable insights about your storage in less than 30 minutes. IBM Storage Insights is an off-premise software as a service (SaaS) offering that is offered through the IBM Service Engage website. This simple, graphical tool has built-in reports to help you rapidly understand what is happening in your environment and provides recommendations about how you can maximize the benefits of your storage and improve your decision-making process. This publication is designed to help storage administrators learn about benefits, features, and key implementation scenarios. The retention period for daily performance data was updated in February 2017. IBM Marketplace links were added in March 2017.